This year at the Henry Farm variety development is starting a project to help strengthen our native bee populations. Like most commercial blueberry growers, we rely heavily on hives of honey bees (Apis) managed by a local beekeeper to ensure good pollination of our blueberry crop. However, honey bees are actually not very efficient pollinators of blueberries. They also don’t work the flowers very much in cold or rainy weather. Native bumblebees (Bombus) and orchard bees (Osmia) are much better adapted to pollinate blueberries. They are more active than honey bees in cold and rainy weather. Bumblebees and orchard bees also have long tongues that easily reach the nectar in blueberry flowers so they are more attracted to blueberries than honey bees are. In fact, Osmia bees are also known by the common name “blueberry bee” in some areas. Finally, bumblebees and orchard bees use buzz pollination to cause the blueberry anthers to shed pollen, but honey bees do not. Buzz pollination greatly enhances pollination in blueberry flowers. 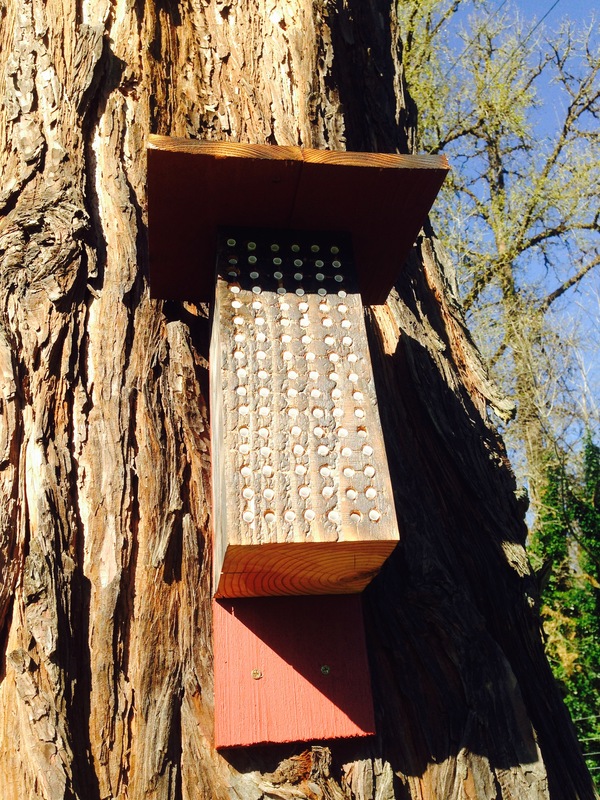 Encouraging native bees is easy. The first thing we are doing is planting a bee garden perennials that will act as a food source for native bees. The idea is to choose hardy plants that are attractive to bees, and flower before and after (but not during) the blueberry plants. 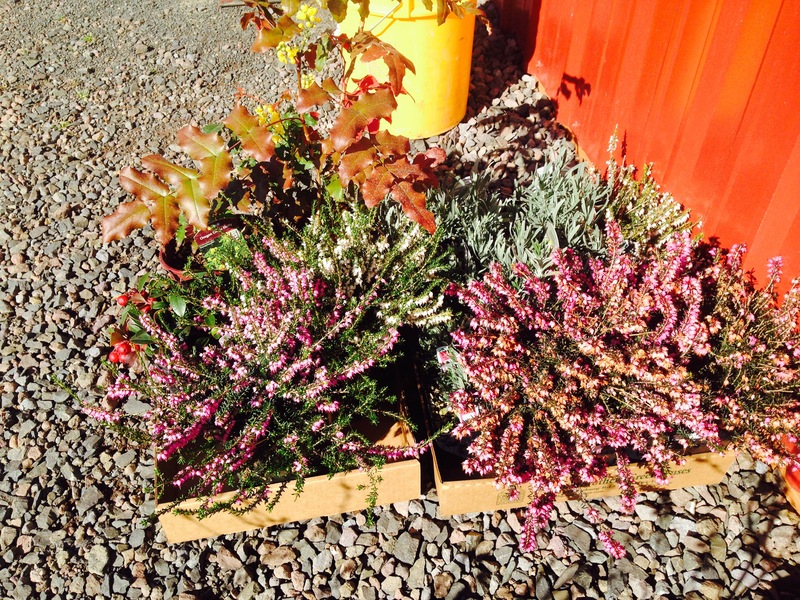 In our area, we are planting winter heather (Erica) and Oregon Grape (Mahonia) to flower before blueberry bloom season, and Lavender (Lavandula) to flower after the blueberries. This year, we are testing several varieties of each to determine which grow best in our soils and to be sure their bloom times don’t overlap with our blueberries (this could lead to competition between the blueberries and the bee garden plants). We’ve selected an area that has already been maintained weed free for several years along the fenceline to plant the bee garden, so we won’t have to worry too much about weeding the area. After we have a better idea of which varieties to plant we make a larger planting of the best ones. The second thing we are doing is building some nest boxes for orchard bees. These are very easy to make, just drill 3/8” holes 8” deep into boards or blocks and fix them securely to a location where they will receive early morning sun exposure. The holes are filled with special 5/16” paper tubes available from orchard products suppliers. (The tubes make it easier to clean out old nests, allowing new bees to colonize them. If you don’t want to use the paper tubes you can just drill 5/16” holes.) Apparently charring the surface of the blocks makes them more attractive to bees as well. And finally, we are following guidelines on pesticide use to minimize the impact of our sprays on bees by choosing products with low toxicity to bees and applying pesticides at times when bees are less active.